The tower, built from Portland stone, offers fabulous views over Dorset. At least is does on a clear day. I chose a greyish afternoon for my visit and even then the panorama was pretty good, but nothing to what it’s like when the sun is shining and the sea is blue. A new National Trust car park opened in June 2015 and the tower is now open seven days a week, weather permitting. The car park is pay and display (free to NT members) and is itself a great viewpoint. 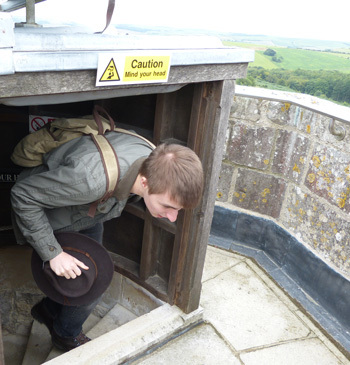 Climb the 120 steps to the top of the tower and you’ll be rewarded, on a clear day, by a glimpse of the Isle of Wight. The tower was bought by the National Trust in 1938 but has been plagued by access problems – until June 2015. Now that that the Trust owns the car park, the parking issues reported on Tripadvisor are a thing of the past. 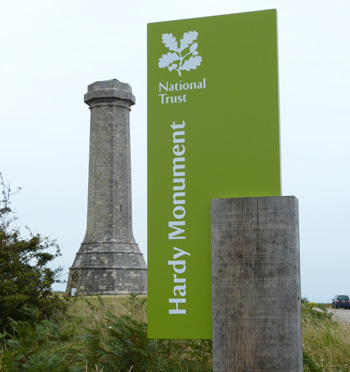 Many visitors to the Hardy Monument will, under understandably, make the connection with author Thomas Hardy. It is, after all, in the heart of Hardy country, just down the road from his home town of Dorchester. But the tower is a monument to another Hardy, the sailor and Vice-Admiral Sir Thomas Masterman Hardy. He was Flag Captain of HMS Victory at the Battle of Trafalgar in 1805 and is remembered by the slightly odd phrase “Kiss me, Hardy”, spoken by Lord Nelson as he lay dying during the battle. As befits a sailor, the Hardy Monument has plenty of nautical references. It’s shaped like a spyglass of the kind Hardy would have used, although it’s doubtful he’d have ever pointed one at the ground. It’s a compass, with each of its eight corners facing a compass point. Weymouth and Portland from the Hardy Monument. How much better it will look on a sunny day! And its location was chosen so that sailors could use it as a navigational reference point. There being no GPS in 1844 when it was built, landmarks were invaluable guides to the many navigators sailing off the south coast. The tower is set in an area of heathland that’s been designated a Site of Special Scientific Interest because of its geology. Take a picnic and enjoy lunch with the views. That’s what I plan on doing! The car park problems are not a thing of the past. It is open, weather permitting, for only 120 out of 365 days and for an abysmal 5 out of 24 hours on those days. Why close it. It is a car park. For cars to park in.